Black Star Farms: A Fantastic Destination-We've visited the wine tasting room Black Star Farms at Sutton's Bay, Michigan, several times in the past, so I enjoyed this account of a visit there at The Wine Monologues of a Wine Enthusiast blog. 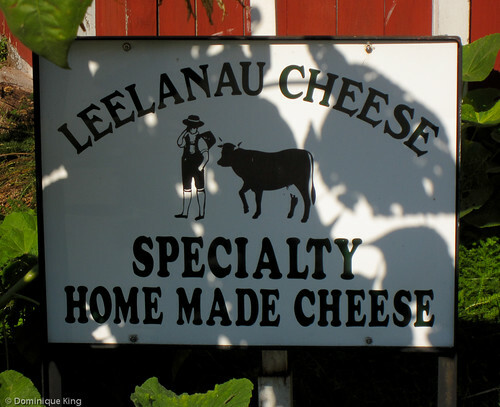 I enjoy the winery's Rieslings, and during our last visit, we stopped by the Leelanau Cheese creamery tucked behind the Black Star Farms tasting room to sample (and take home) some of the fab Raclette Cheese. Planning a Visit to Traders Point Creamery-Nicole takes readers of her Arrows Sent Forth blog to another great Midwest creamery. Traders Point Creamery is one of the country's only all-organic dairy farms, and it looks like a great place to visit with your family and sample some ice cream! Bath School Disaster-The recent tragedy at Newtown, Connecticut reminded Debra Ann Pawlak of the disturbing story of the worst act of violence against a school. I read this sad story about a year or so ago in a book about the 1927 tragedy in mid-Michigan which claimed the lives of 45 people, most of them children. CLE Reads: Les Roberts' Whiskey Island-I was thrilled to read Amanda's review of author Les Roberts' latest book in his Milan Jacovich mystery series at the Clue into Cleveland blog. I got Tim hooked on the series after buying him the first couple of books in at when I visited Ohio for a writers conference. We didn't know about this newest addition to the series, or the one immediately preceding it. Thanks for helping me do some Christmas shopping, Amanda! Finding Hendricks County's Historical Markers-Eric posts this report on the county's All Access blog, and includes a couple of the markers I saw on my own trip there recently. I'll be posting more of my stories about Hendricks County, which will include my take on a couple of these markers, in coming months. Meanwhile, I'll be looking for Eric's take on Hendricks' Samuel Luther Thompson marker. 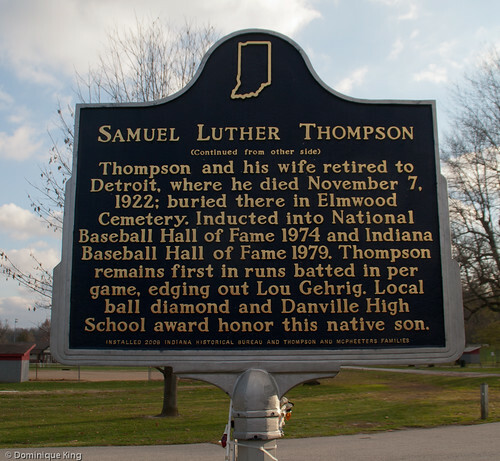 Thompson played with the Detroit Tigers baseball team in the early 1900s, so it was a must-see site for me when I was there. Indianapolis Collected: A Dirty Tale of Mudpack Marketing-Libby shares some dirty tales of the "toilet" concerns of Indianapolis citizens over the years at the Historic Indianapolis blog. I do appreciate the sense of humor displayed here in what could be a more pedestrian story about cosmetic products made and marketed in Indianapolis during the early 1900s. This blog always offers a fun and interesting look at Indianapolis history. The Beauty of Cleveland's Guitar Mania at the Rock & Roll Hall of Fame-Justin shares his collection of photos of decorated guitars at his InACents blog. Artists decorated 54 large guitars that later were on display throughout Cleveland, but Justin happened to catch the collection when it was displayed together in front of the Rock & Roll Hall of Fame museum last summer. Family Cabins at Brown County State Park-I've enjoyed staying at a couple of Ohio's State Park inns, and I've always wanted to try staying at the lodges or cabins in one of Indiana's State Parks. Check out Nicole's story at the Indiana Insider blog about her family's stay in a cabin at Brown County State Park. Ohio Caverns-You wouldn't think of Ohio as a place to find cool caverns, but think differently! Michael shares this report about some of the state's visitor-friendly caverns at the Discover Ohio blog. Born & Raised in South Detroit-Sorry Steve Perry and Journey, but there is no such place as South Detroit. Farlane shares one of my favorite pieces of trivia and a great photo taken by DetroitDerek at the Michigan in Pictures blog. Yup, Canada is -south- of Detroit, something I've pointed out myself multiple times over the years! Meet Christian Clemens, founder of Mt. Clemens-Check out Amy's story about Mt. Clemens founding at her Night Train blog. I've always been fascinated with Ohio's canals, and Michigan's lack thereof, so I especially enjoyed learning about Christian Clemens' connection to Michigan's ill-fated Clinton-Kalamazoo canal. I've written a couple of stories this week about looking at history from a Canadian perspective along the Detroit River, so it only seems fitting to close out the week with another view of Detroit and its iconic Renaissance Center from the Canadian side of the river. The central tower in this group of interconnected skyscrapers was, and still is, the tallest building in Michigan since its construction in 1977. It is 727 feet tall and houses a 73-floor hotel atop several floors of mixed-use space. Check out my post celebrating Midwest Guest's third anniversary this past summer. It features a different view of the Renaissance Center from the Detroit side of the river! Living near the Canadian border means you have some great opportunities to learn about history from a different point of view than you'll get from your American history books and classes. 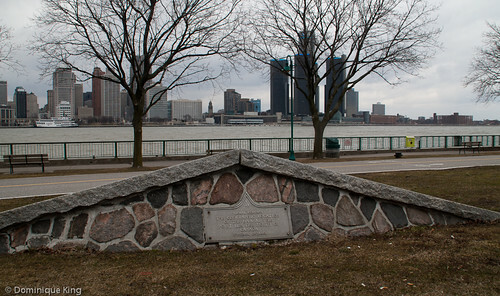 You can check out a number of historical markers describing events from the Canadian perspective by taking a quick walk along the riverfront just across from Detroit in Windsor, Ontario. 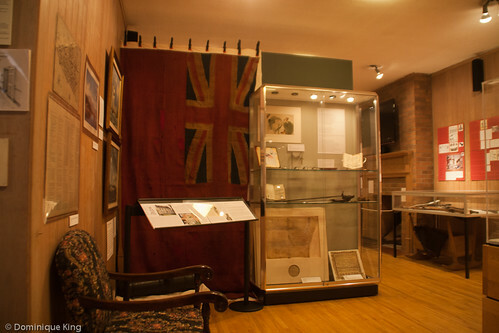 We recently visited the Windsor Community Museum at the historic Baby (pronounced "Bobby") House tucked in among a few city skyscrapers and learned about the Canadian experience during the War of 1812 and how that conflict led to developing Canada's strong solidarity and sense of national identity. There are a handful of historic markers within a mile of the Baby House marker and further along the Detroit River. We managed to visit a few of them on a cold and windy day. 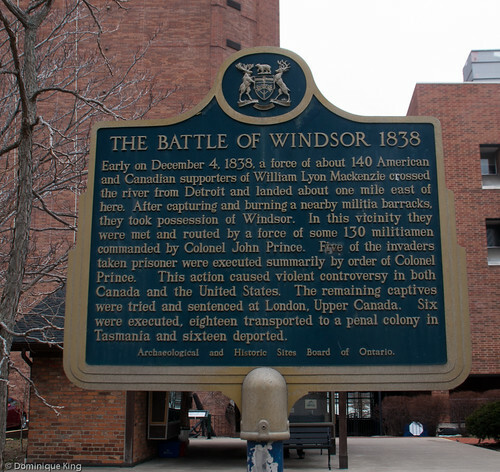 A marker within a few steps of the Baby House tells the story of The Battle of Windsor in 1838. This event took place during a largely failed rebellion against the British colony of Upper Canada, which included much of present-day southwestern Ontario. Pro-rebellion forces invaded Windsor near this spot, but pro-government forces repelled and captured the invaders. Subsequent executions and deportations of the invaders caused controversy on both sides of the border. 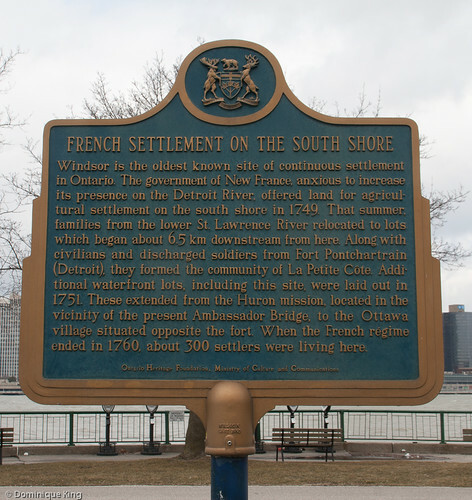 Further along the riverfront, a marker commemorates the early French Settlement of the South Shore of the Detroit River. Officials of the New France government offered riverfront lots to settlers in an effort to encourage the development of a strong French presence along the river in the mid-1750s. 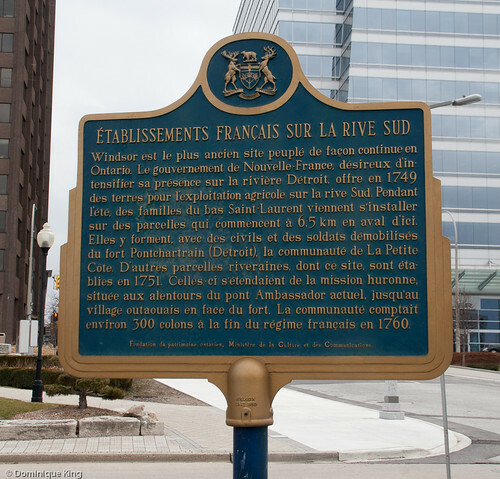 Even as French control of the area ended by 1760, many influential French families like the Babys remained in the area and played an important role the development of Windsor, which boasts the longest history of continuous settlement in Ontario. 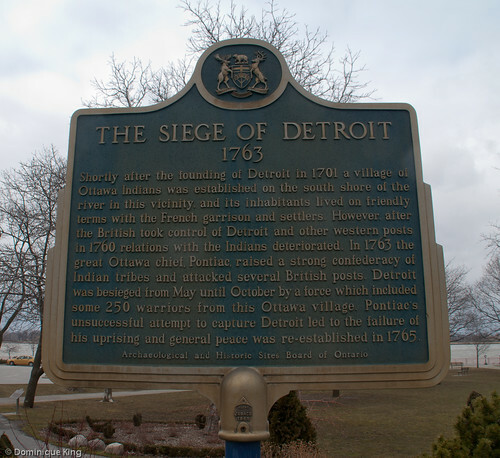 The Siege of Detroit marker tells the story of the Ottawa Chief Pontiac, who led a group of Indian tribes in attacking British posts. The tribes lived peacefully with the French soldiers and settlers who arrived in the mid-1700s, but after the British took control of the area, relations between the native tribes and British forces went downhill. Chief Pontiac's forces attacked and held siege upon Detroit with many men from the Ottawa village on the south side of the Detroit River. The British prevailed after surviving a May through October siege and established generally peaceful relations with the tribes by 1765. Hopefully we can return to Windsor soon (and on a much sunnier and warmer day!) to check out a few more chapters of Windsor and Detroit history along the Detroit River. 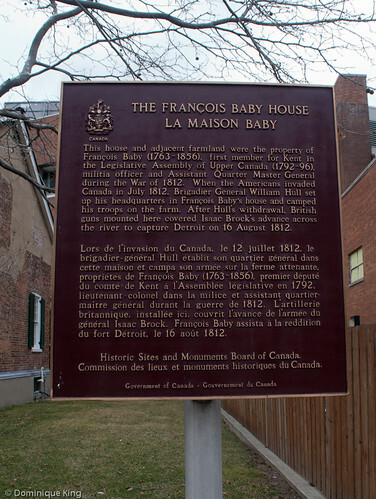 Read my story The Baby House spotlights Canadian history and identity in Windsor, Ontario to learn more about the Baby family and their role in Windsor's history, and check out Photo Friday: Yes, Canada is south of Detroit! for the story of another marker we found along Windsor's riverfront. Want to learn more? Check out The Penguin History of Canada by Robert Bothwell, A Traveller's History of Canada by Robert Bothwell, or Uppermost Canada: The Western District and the Detroit Frontier, 1800-1850 by R. Alan Douglas. There are many events commemorating the bicentennial of the War of 1812 in the U.S., but crossing the Detroit River from Michigan to visit Windsor, Ontario, offers a great way to learn about this war from a different perspective. I don't recall learning much about the War of 1812 in school, beyond hearing about General Hull's humiliating surrender of Fort Detroit to the British and seeing monuments dedicated to Oliver Hazard Perry's victory over the British to regain American control of Lake Erie when I visited Ohio's Put-In-Bay and Pennsylvania's Presque Isle. Visiting Windsor's Community Museum at the historic Baby (pronounced "Bobby") House this year to view the "Living in 1812: Life on the Sandwich Frontier" exhibit offers an intriguing look at the Canadian experience, the Canadian take on the War of 1812, and a look at how the conflict helped shape Canada's strong sense of national identity. The French-Canadian Baby family was one of the richest and most powerful families in the Western District of Upper Canada, which included much of present-day southwestern Ontario. Much early settlement along both sides of the Detroit River consisted of ribbon farms, narrow tracts of land with a short length of river frontage. Francois Baby, born in Detroit in 1768, purchased one of these farms from his mother, Suzanne Reaume Baby, for 10 shillings and one grain of pepper in 1800. Francois was a militia officer, politician, and business person who joined the British forces during the War of 1812. He saw action in places like Detroit, Frenchtown (Monroe, Michigan) and Fort Meigs (near Perrysburg, Ohio) before his capture by Americans in 1814. 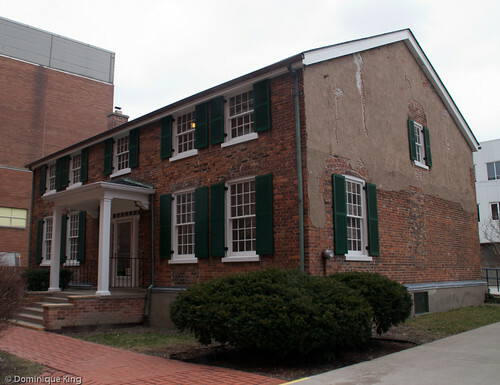 The brick house he built for his family, which included wife Frances and a dozen children, faced the Detroit River, making it strategically important to both American and British forces. The Americans, under General Hull, occupied the property during the summer of 1812, with officers living in the house and hundreds of soldiers camping in Baby's orchards and gardens. After Hull withdrew to Detroit on August 7, British Major General Isaac Brock led the bombardment of Detroit from Baby's property that resulted in Hull's infamous surrender on August 16. Baby returned home in 1815 to repair heavy damage caused by the occupations in his absence. He tried resuming his political career, and spent time running a ferry and an inn from his property as what eventually became the present-day city of Windsor grew up around him. 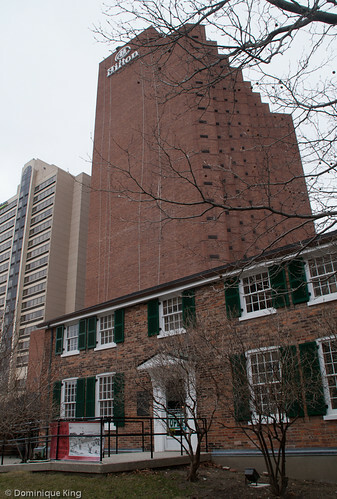 The house was a battle site again in 1838 during a largely failed rebellion against the government of the British colony of Upper Canada, a fire that heavily damaged the house in 1850, and Francois Baby died in 1852. Subsequent owners made many changes, and the house was an abandoned wreck during the Great Depression of the 1930s. Ownership reverted to the City of Windsor for non-payment of taxes by the end of that decade. 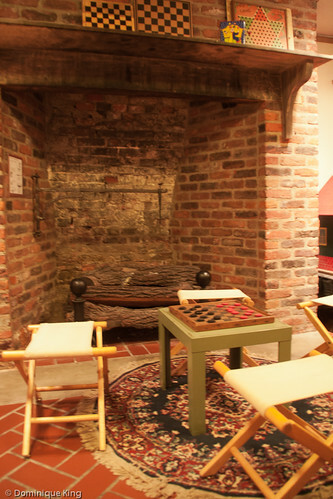 There were no existing original plans for the house, so a 1948 restoration team renovated the site based on then-available research and speculation about the house's original appearance. All that remains of the original structure is a rubble foundation, the back of a fireplace in the basement, the two end walls, much of the north wall and some supporting timbers at the north (or river side) entrance. It is now two-story brick Georgian Revival style home with a symmetrical design, a central hallway, and a front door that faces away from the river. In 1950, Canada recognized the house as a National Historic Site. Later in the 1950s developers building Cleary Auditorium wanted to move or destroy the house. Preservationists prevailed, but at the cost of the home's expansive river view. Today, the St. Clair Centre for the Arts dwarfs the Baby house, standing between it and the river. 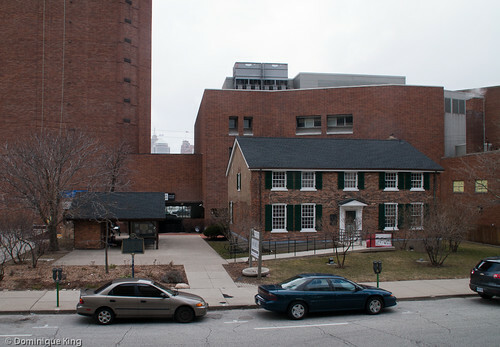 The house is home to the City of Windsor's Community Museum, opened in 1958, and its collection of more than 15,000 artifacts and archives concerning the history of Windsor and Greater Essex County. Want to learn more? Check out The Invasion of Canada: Battles of the War of 1812 by Ronald Dale, Searching for the Forgotten War - 1812 Canada by Patrick Richard Carstens and Timothy L. Sanford, or Quebec During the American Invasion, 1775-1776: the Journal of Francoise Baby, Gabriel Taschereau, and Jenkin Williams edited by Michael P. Gabriel and S. Pascale Vergereau-Dewey. Photo Friday: Yes, Canada is south of Detroit! I remember being in a Canadian online chat room many years ago and having another participant make all sorts of fun of the geographically impaired "south of the border", meaning people from the States clueless about Canadian geography. I replied that I didn't see any more ignorance of geography among those of us in Detroit than people I'd met south of the border in Canada. Much chiding of me on his part ensued for what he saw as typical ignorance of those in the States about geography. He couldn't believe that I would insist that Canada was south of Detroit. I insisted that he check it out on a map. Seeing that this was a number of years before a lot of folks had a nice graphic interface to the Web, there was silence from him as I think he went to a book (remember those?) to look and see what this crazy Detroiter was on about. And he discovered that Detroit really is north of Canada! I wish I had these photos ready at hand at that time. 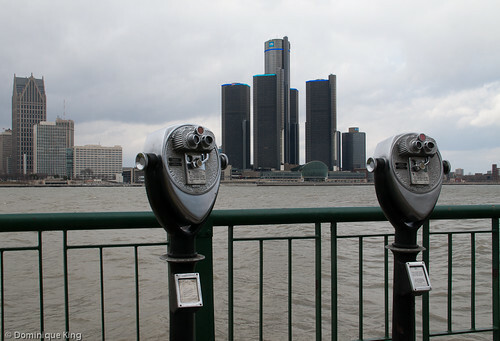 Here you see the marker in a park along the riverside in Windsor, Ontario, that points to Detroit's distinctive skyline. 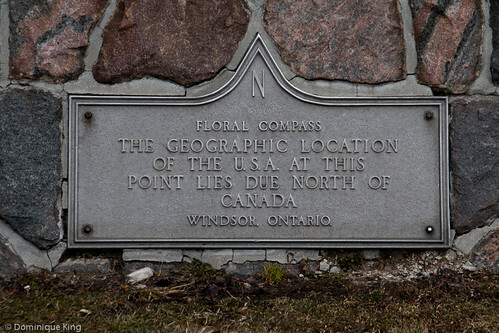 The marker's text clearly shows that some folks in Canada do know that Detroit is north of Canada! And with all due respect to the band Journey, there really is no such thing as the "South Detroit" they mention in the lyrics to the 1981 song, "Don't Stop Believin". Journey's Steve Perry said the song originated when the band was playing some Detroit gigs. Detroit was at the top of their minds when they began to put the lyrics together. Perry liked the sound of "South Detroit" then and only found out many years later that there really was no such location. Meanwhile, remind me someday to tell the story of being in a club in Ottawa and, when someone introduced me as being from Detroit, a Canadian there said, "Detroit? Is that anywhere near Boston?" Yup, true story. 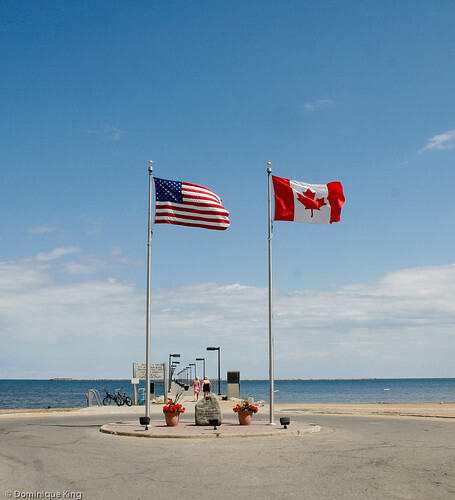 We spotted a Canadian flag flying at a dock in Harbor Beach, Michigan, stopped to investigate, and learned about a marathon swimmer who became the first person to swim across all five Great Lakes during one amazing summer. Canadian Vicki Keith slipped into the water at this spot in the early morning hours of July 17, 1988 and started swimming. She kept swimming through the days and nights. Heavy wind threw her three miles off course, although a northern current help get her back on course as she continued swimming towards Canada. Heavy fog set in as Keith kept swimming, accompanied by a Canadian Coast Guard ship to help guide her the final miles of her epic swim. 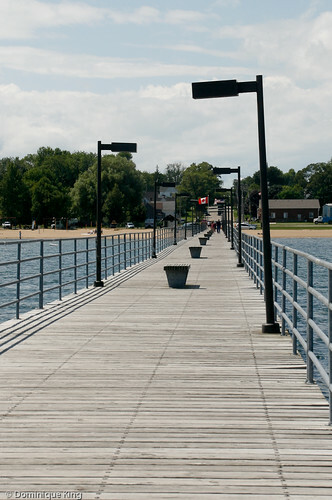 Two days after first slipping into the water at Harbor Beach, a cheering crowd of 400 greeted Keith at the shore in Goderich, Ontario, where she became the first person to swim across Lake Huron. The 45-mile swim took Keith 46 hours and 55 minutes to complete. So, what compelled Vicki Keith to reach for a goal many thought was impossible to achieve? The dedication and perseverance of the disabled athletes she worked with as a swimming coach drove her to embrace the challenges of marathon swimming in order to raise more than $1 million over her lifetime to fund swimming programs for those athletes. The thought of how those athletes met their own challenges kept Keith swimming through cramps, vomiting, hallucinations and other challenges as she crossed Lake Huron, Lake Superior, Lake Michigan, Lake Erie and Lake Ontario. The Lake Huron swim was just one leg during a two-month journey that finally ended on August 30, 1988, as Keith touched the Lake Ontario shore in Toronto, Canada, becoming the first person to swim across all five Great Lakes. Nothing in Keith's childhood hinted at those amazing athletic achievements, though. She was born in Winnipeg (Manitoba, Canada) in 1961 and grew up as a pigeon-toed, nearsighted kid who wasn't particularly good at sports. She did like to swimming, learning to swim by the age of five and becoming a lifeguard and swimming coach as a young adult. By the age of 18, Keith began thinking about swimming marathons. She set her first two world records for a 19 kilometer butterfly swim and a 100-hour continuous swim within three months of starting to swim seriously in 1984. Her record swims across each of the five Great Lakes, as well as accomplishments like becoming the first person to complete a butterfly-stroke swim across the English Channel and setting a record for the longest solo swim of 63 hours and 40 minutes, earned Keith over 41 awards and recognitions and 16 different world records over her marathon swimming career. Her last major marathon swimming accomplishment came in 2005 when she came out of retirement to swim on Lake Ontario in an attempt to bolster her lifetime earnings for charity to $1 million. Rough weather and water meant it took two tries to finish the swim, but Keith met her goal. The thought that nothing is impossible if you want it badly enough and the message that you should believe in yourself as you reach for high hopes and dreams is one that Keith shares with business, service and school groups as an inspirational speaker. Today, Vicki Keith lives with her husband John at Amherst Island on Lake Ontario near Kingston, Ontario. She continues to coach competitive swimming for a team of disable athletes, including seven who competed at the national level in competitive swimming and three who competed in marathon swimming. Be sure to check out this video from last year's TEDxWaterloo to hear her inspirational message and her story about working with a particularly determined athlete, quadruple-amputee Ashley Cowan who swam across Lake Erie in 2001. 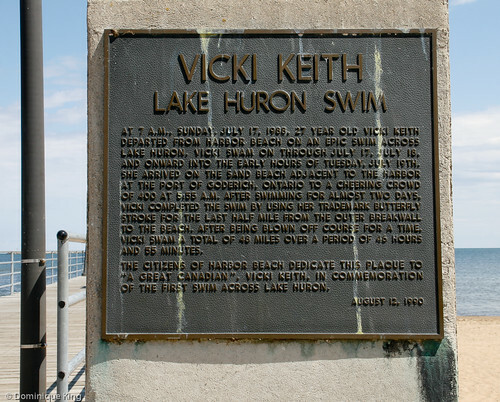 Geocachers visiting the site at Harbor Beach will want to search for a micro cache hidden near the plaque commemorating Keith's Lake Huron swim.